One of the things you have to do when you visit the Lake District is go on a lake cruise. We escaped the crowds of Windermere, and drove over the spectacular Kirkstone Pass to Ullswater Lake, to go on a cruise on the historic Ullswater Steamer boats. 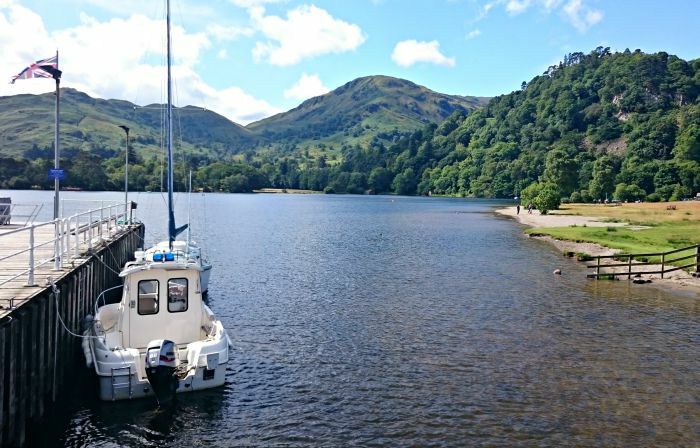 Ullswater Steamers have operated lake cruises on Ullswater for over 150 years, and these cruises give you the perfect opportunity to sit back, relax and enjoy the spectacular scenery of England’s ‘most beautiful lake’. 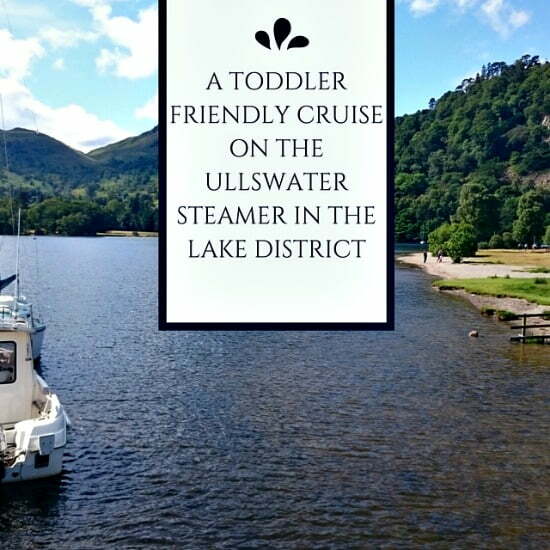 Now as everyone knows, toddlers don’t really sit still for a long time, and aren’t really interested in admiring views, but Ullswater Steamers have got a lake cruise which is perfect for toddlers and young children. 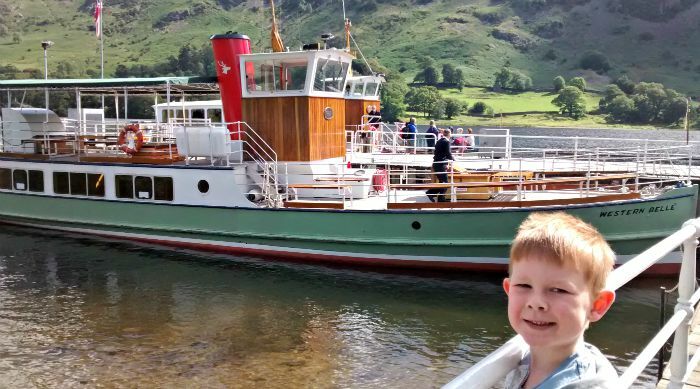 Departing from Glenridding at the south side of the lake, you can take the Ullswater Steamer for a 25 minute lake cruise to the Aria Force pier before doing a short walk to see the magnificent Aria Force waterfall. 25 minutes was the perfect length of time for a boat cruise with our boys aged 5 and 2 who don’t really sit still for long periods of time. However they loved sailing past islands, and spotting other boats on our short cruise to Aria Force Pier. Once we arrived at Aria Force Pier, we started walking up to the Waterfall. 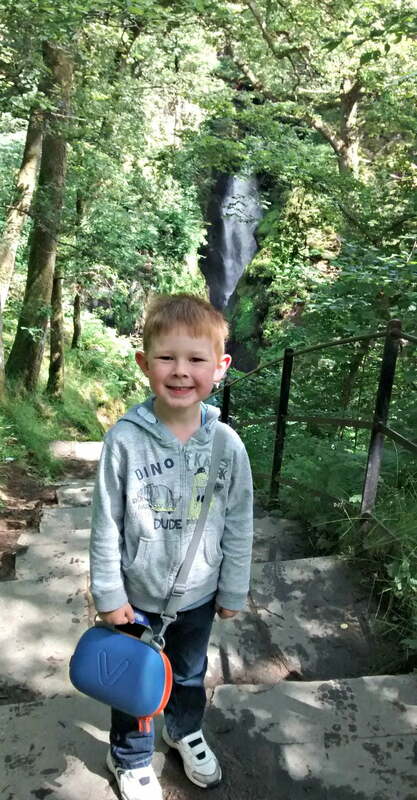 It is a 20 – 30 minute walk from the Pier to the spectacular 65 foot waterfall with a slow toddler in tow. 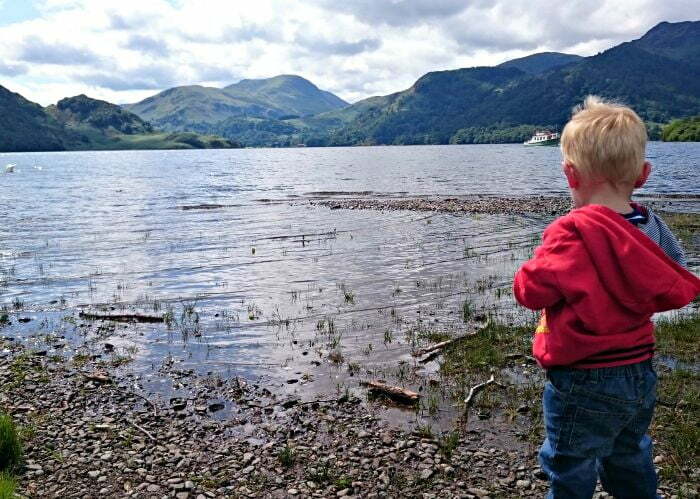 The walk is fine for toddlers who are confident walkers, but isn’t suitable for buggies. It is a very pretty walk through woodland, past an adventure playground and gets very exciting when you can hear the roar of the water in the distance! The waterfall itself was amazing – there had been quite a bit of rain in the days beforehand so the water was thundering over the edge of the 65 foot drop. It was both boys first experience of a waterfall and they were mesmerized. 2 year old Daniel was shouting ‘water, water’, and 5 year old Matthew began asking loads of questions about where the water was coming from, where it was going and if we could swim in the pool at the bottom (!). We spent quite a bit of time going to the various platforms around it, so we could see it from lots of different angles. We walked back down, had a bite to eat in the National Trust Tea Room at the bottom and played in the playground before catching the Ullswater Steamer back to Glenridding. 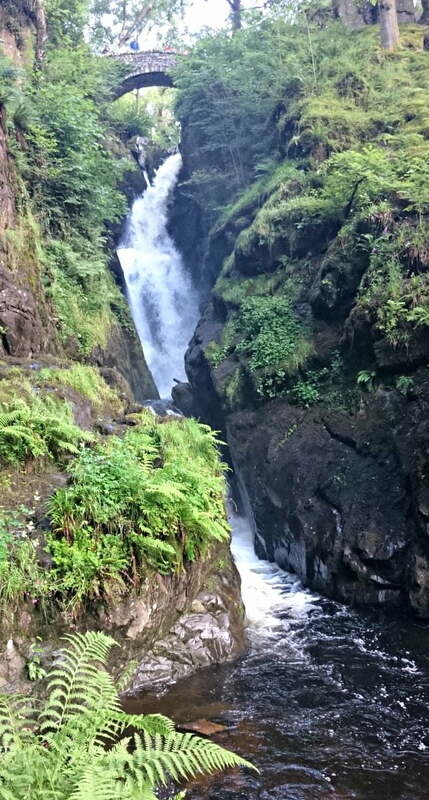 In hindsight, we wished we had paid for longer car parking at Glenridding, so we could spend longer at Aria Force. We had bought a ticket for 3 hours parking but wish we had got longer as Aria Force is in a spectacular setting with a picnic area, great playground for the boys to play in and tea room. There is a Pay and Display parking at Glenridding pier so bring enough change. The parking was £3 for 3 hours and £5 for 5 hours – the car park gets busy in summer months so get there early as it’s not massive. 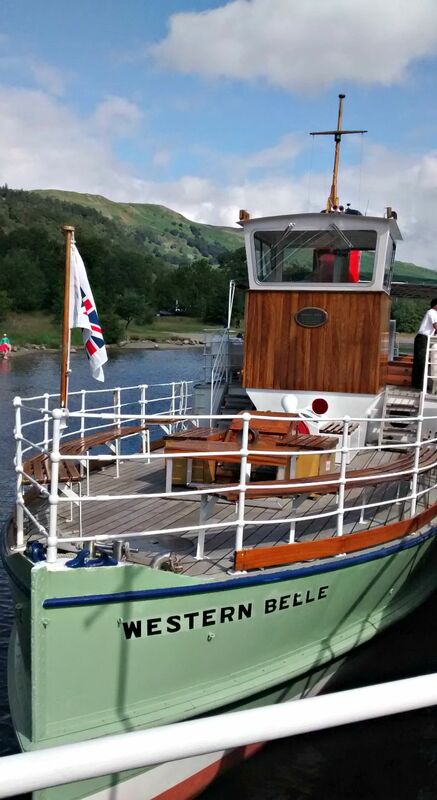 For timetable information, look on the Ullswater Steamers website. Ullswater Steamer customers get a 50% discount on Ravenglass Railway tickets. There is a kids activity pack available via the website too. Wow! That waterfall looks amazing! My littlest is almost one. I’m thinking next year when he’s walking better we will definitely check out the Lake District and do a steamer boat tour!! Absolutely stunning! Great review, certainly a trip I’d like to take if I was in that part of the country.